Minnesota visitor Steve Bona described to state officials how he helped a California woman who had been attacked by a shark off Kaanapali yesterday. Bona estimated the shark to be 8 to 10 feet in length. 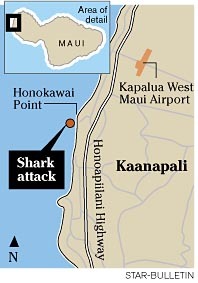 KAANAPALI, Maui >> A shark attacked a California woman as she swam off the Kaanapali coast yesterday morning. It was the third shark attack off the Valley Isle this year. Julie Glance, 33, of San Diego, was taken to Maui Memorial Medical Center in critical condition, but was later upgraded to stable condition. Police Sgt. David Lake said Glance was bitten on the right shoulder, forearm and wrist in waters 100 yards offshore near Embassy Vacation Resorts. "We don't know what size or what kind of shark it was," Lake said. Most attacks in Hawaii involve tiger sharks. 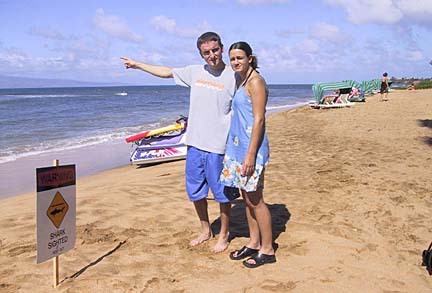 Steve Bona, a Minnesota visitor who was about 20 yards from Glance, said he had just arrived on Maui and was in the water about 15 minutes when he saw a body of a shark dive in front of him. "It came out of the water," Bona said. "It was big." Bona estimated the shark was 8 to 10 feet long and said it had a gray color. Bona said a wave blocked his view of the shark for a moment, then he saw a woman who had been swimming calling for help. "She just was screaming, 'Help, help, help,' " he said. "I was terrified when I saw the shark." Bona acknowledged that after seeing the shark, he paused for a second. But he saw no one in the vicinity and no one moving to help her. "I thought I got to go out there. I just went there. It was scary," he said. Bona, who was on a boogie board, said the woman began floating on her back and kicking to shore but barely moving through the water. Bona said he moved toward her, put her on his board, and kicked toward shore. "I was kicking as hard as I could," he said. "She was saying she didn't want to die. She had children. She was bleeding a lot," Bona said. He said the woman was bleeding and blood was in the water around her. Bona said the woman's most severe injury appeared to be at the wrist. He said he was exhausted by the time he reached shore and several people came to assist her. His girlfriend, Jenni Pomaville, said she ran to call 911. Minnesota visitor Steve Bona pointed to the site 100 yards offshore where a shark attacked a visitor yesterday in Kaanapali, Maui. Bona helped the woman to shore. Standing next to him is his girlfriend, Jenni Pomaville, who called 911. They brought towels to try to stop the bleeding and a physician and nurse who were in the vicinity treated the woman until paramedics arrived. Lake said Glance was conscious and alert when she was transported by ambulance to the hospital. She was staying at the Embassy resort with her family, including her husband and parents, Lake said. 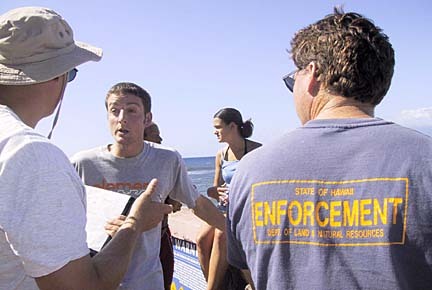 After the attack at about 10:30 a.m., state and county officials posted warning signs from Black Point to Honokowai Park and prevented people from entering the ocean within a mile of the attack. Officials were expected to examine ocean conditions this morning before making a determination whether to allow people into the water. County lifeguards said the site of the attack has an ocean depth of about 5 to 8 feet and a variety of reef life, including turtles and fish. "There are sharks definitely out there," county water safety official Archie Kalepa said. Kalepa said at about 2 p.m. yesterday, a 5-foot-long white tip shark was seen swimming in the vicinity of the attack. But Kalepa said white tips aren't known for attacking people. Two other shark attacks have occurred on Maui this year. Los Angeles recording artist Thomas Holmes was bitten on the right buttocks and both thighs while snorkeling about 100 yards offshore in 40 to 50 feet of water off Olowalu in west Maui on Jan. 1. Karen A. Miller, a part-time Kihei resident from Idaho, was severely bitten on the left foot while swimming 20 yards offshore in 15 feet of water north of Kamaole 1 Beach Park in south Maui on Oct. 30. The last shark attack in Kaanapali occurred about four years ago when a resident was bitten as she swam about 300 years offshore near Whalers Village.